Old Bluemont village has a "new" historic site: the 185-year-old Snickersville Academy, originally built to serve the young village as a schoolhouse, church, and a community meeting hall. In September, Tom and Betty Hatcher, along with Walter and Joyce Hatcher, gave the structure to Friends of Bluemont, a local citizens association focused on the community's history. The Hatchers live in Florida, but have deep roots in Western Loudoun County. "The historic Snickersville Academy has survived more than 185 years," declared Friends of Bluemont president Susan Freis Falknor. "Now, with a lot of help from the community, it can continue for centuries more." "We hope to make the Snickersville Academy a site for visitors to learn about the village's earliest history and experience the charm of a bygone time," she added. The Hatcher family who live in Florida, but have deep roots in Western Loudoun, made the gift in memory of Tom and Walter's mother, Catalina Hatcher, a strong-minded and beloved figure in the village, who summered in the log structure through the 1990s. 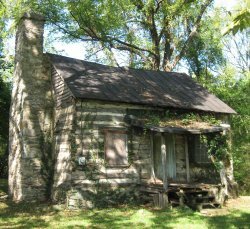 Tom Hatcher remembers his mother's love of the cabin, of the woods around it, and the feeling of "serenity" there. He recalls a story that one evening, when his mother was resting on the porch, a Bluemonter watched a bear ramble past the cabin and on into the village. Says Hatcher: "The bear didn't bother her, and she didn't bother the bear." Friends of Bluemont, a preservation organization founded in 2003, has long hoped to save the Snickersville Academy. Friends of Bluemont founder and Loudoun schoolteacher Evelyn Johnson started off the formal effort with a fundraiser picnic in 1999. "Snickersville," the original name of the village, was replaced by the more dignified name of "Bluemont" in 1900, with the arrival of the railroad and upscale vacationers escaping the summer heat of the Capital Area. To follow the progress of the preservation of the Snickersville Academy, see www.BluemontVA.org or www.friends-of-bluemont.org.